BICC Press/Events/Panel Discussion: Protection and Opportunities? You are here: Home » Press » Events » Panel Discussion: Protection and Opportunities? BICC and the Journal Wissenschaft und Frieden (W&F) invite to a discussion on “Protection and Opportunities? 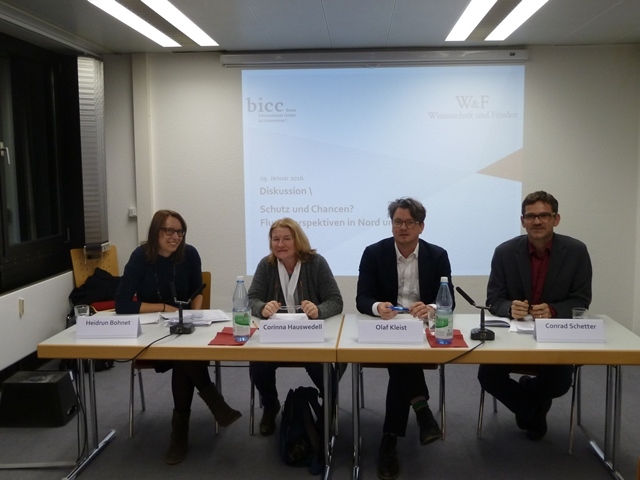 Perspectives of the displaced in North and South“ at BICC on 29 January 2016 (in German). Wars and violence in the Middle East and Sub-Saharan Africa are a major cause for the huge refugee movements of today. Hundreds of thousands of people are on the move, searching for protection and security within one or between different states, such as South Sudan and Ethiopia or Syria and its neighbouring countries. One share of the displaced is looking for support and new perspectives in regions that are further afar: Europe remains one of the major attractions. · What are the different expectations in the Global South or Europe concerning displacement, migration, return and integration? · How can experiences (of violence) of refugees be understood as a chance in their new societal surroundings? · Dr. J. Olaf Kleist, Refugee Studies Centre, Dpt. of Intern. Development, University of Oxford.